Willux.be Review 2019: Is Willux.be a Good Hosting? If you're looking for a Dutch cloud hosting company with premium technical support services, Willux.be will be worth looking at. It provides both Linux and Windows cloud hosting at acceptable prices with configurable servers. 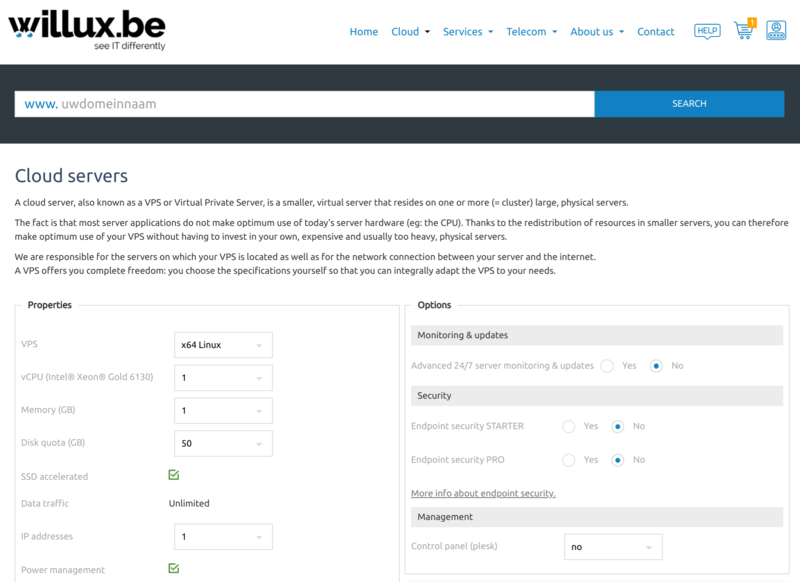 Willux.be is more than just a run-of-the-mill hosting provider, and since 2004 it has been providing hosting (with a focus on the cloud) as well as custom ICT solutions for its customers. This vendor takes particular pride in its strong technical team that continually monitors servers and solves customers’ problems. Willux.be is based in Belgium and has a Dutch website. You can choose between a Linux or Windows server for both shared hosting or cloud server hosting. However, instead of the usual setup with cPanel for Linux and Plesk for Windows, all hosting plans are powered by Plesk. Both also include a one-click installer for a variety of hosting scripts and apps. Hosting plans include POP3/IMAP email hosting with unlimited redirects as well as spam and virus filters. Tight security measures safeguard your hosting with firewalls, IP blockers, and network intrusion detection and prevention. Client accounts are also jailed, to stop attacks or issues from spreading between hosting solutions. You can customize your cloud server by configuring between 1 and 8 CPU cores, up to 24 GB RAM, up to 1000 GB of storage, and up to 4 IP addresses. You can also purchase extra endpoint security as well as the ability to host multiple Plesk accounts. In addition to its hosting products, Willux.be provides related services like custom infrastructure or hosting solutions, managed services, printing, and consultancy. In short, there’s something to solve almost any hosting problem. Willux.be’s prices start at the low, and its most expensive plans are averagely priced, with the Windows packages understandably being more expensive than the Linux ones. While not one of the absolute cheapest hosts, you get higher storage quotas than with most cheap shared hosting providers. There is no free domain, but you do get a free SSL certificate with all hosting packages. Don’t forget that all hosting plans also allow you to host multiple sites (2 – 20). You have to sign up for at least a year, and unfortunately, there is no free trial or money-back guarantee to make you feel better about this minimum commitment. When it comes to customizing your own cloud server, you only pay for the resources you need, but even the most basic setups start at quite high prices. Willux.be’s 24/7 support by telephone is relatively rare, and useful because there is no live chat. Email and ticket support are both available 24/7, too. You can also request a callback, to talk to the support team at their expense rather than yours. For self-support, there is no knowledge base, but if you need a lot of help with your hosting, you can always turn to this vendor’s managed services instead. If you’re looking for configurable cloud hosting with great security, then Willux.be could be an excellent choice. But be prepared to pay for quality. 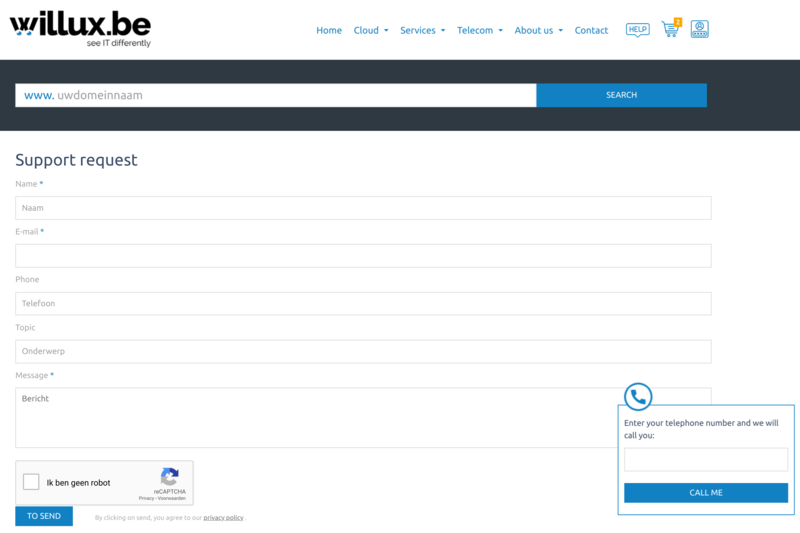 Configure your own cloud hosting at Willux.be! Wondering how Willux.be stacks up against other Web Hosting companies? Enter any other Web Hosting company and we will give you a side-by-side comparison.